Electrophilic radiofluorinations were among the first labeling methods used for the preparation of some of the most important 18F-labeled radiopharmaceuticals, including 2-[18F]fluorodeoxyglucose (2-[18F]FDG) and 6-[18F]fluoro-3,4-dihydroxy-L-phenylalanine (6-[18F]F-DOPA). Despite recent advances in conventional electrophilic fluorination chemistry with 19F, several technical challenges associated with fluorine-18 have limited the application of these approaches to electrophilic radiofluorinations. Along these lines, two particularly important obstacles are the production of 18F-labeled radiopharmaceuticals with low molar activity and the maximum theoretical radiochemical yield of only 50% for electrophilic radiofluorinations starting from [18F]F2 or secondary labeling precursors. 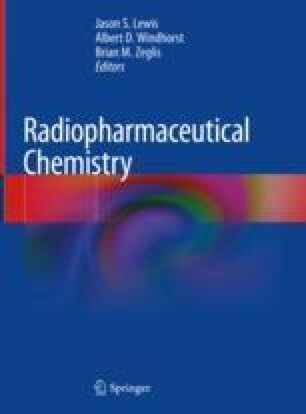 Over the last 20 years, a great deal of work has been dedicated to improving the utility of electrophilic radiofluorination chemistry, with special emphasis on (1) developing novel 18F-labeled electrophilic fluorination agents with improved reactivity-selectivity profiles and (2) increasing the specific activity of 18F-labeled compounds produced via electrophilic radiofluorination chemistry. The chapter will provide an overview of the fundamentals of electrophilic radiofluorination chemistry, followed by an introduction to typical electrophilic labeling agents as well as the use of these reagents for electrophilic 18F-radiofluorinations and 18F-fluorodemetallation reactions. The final part of the chapter will discuss recent developments based on the umpolung of high molar activity nucleophilic [18F]F− into electrophilic 18F+-based synthons to expand the scope and utility of electrophilic 18F-fluorination chemistry.